Whiskey is proof technology does too, and is better at it. The first half of Drink & Food, and you’d be surprised at how many people get those backwards. I’m an Irishman with two Masters degrees in science, meaning I’m genetically, socially and academically trained to drink. Online articles here, scroll down for articles in print magazines. Relaxing with a beer isn’t just the high point of civilisation, it was the starting point too. If you’re looking for the crazy drink experiments from ZUG, alas, the site was shut down recently. Disappearing into the inky black of forgetfulness might be realistic for drinking adventures, but it’s not fun, so I’ll be reposting the experiments here in the future. TAPS is Canada’s number one beer magazine – so number one that it’s recently stopped saying “Canada” in that sentence as it expands into the US. TAPS is also available online at Zinio, so get buying and reading! Some of the smartest scientists in history were all about the beer. Beer already makes your brain better, so why not improve your whole environment? Fall 2011 is where I realize you don’t need a dictionary of flavors or a paint catalog to find new ways of saying “amber.” Science names things properly, and can even incant why beer tastes so good. Celebrating super-science applied to alcohol, with genetic engineering, anti-cancer chemicals, and the knowledge that technology makes absolutely everything better. All about the science of suds. Pick up an issue for the theory, and a pint for the practical. Beer Magazine, appearing at your newstands or through digital subscriptions with all the latest news in Beer. I single-handedly save a thousand teeth, a million table edges, and three reality series worth of embarrassment by researching bottle openers too cool to lose. From Pacman to space-bending mathematics, there’s nothing which won’t help you drink if you really want to. The Nov/Dec 2011 issue assisting me can be found in print or bought and enjoyed online right here. Featuring time-traveling beer, cyborg vampire cells, bomb-detecting cells and even a journey to the moons of Mars. It’s all in Beer Mag #16, and if you missed it at the newsagents you can preview or buy right a digital version right here. 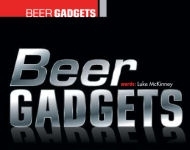 An odyssey of incredibly alcoholic inventions in Beer Mag #14. From the fastest pour in the world, through a arcade keg cabinet to a beer-blasting backpack and a robot butler, you can check it out (and buy the issue) right now. The future arrives in Beer Mag #12, along with a Solar Powered Brewery, Sapporo’s Space Brew (which was in fact in space), and even an anti-cancer alcohol. Because SCIENCE, that’s why! Behold the majesties of the mind here.